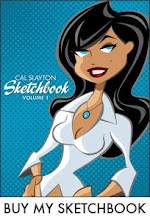 cal slayton | illustrator | graphic designer | comic book artist | dallas | dfw: Come out to CAPE! - A Free Comics Show! Come out to CAPE! - A Free Comics Show! I'll be appearing at the second annual CAPE! The Comics and Pop Culture Expo. It's Son of CAPE! 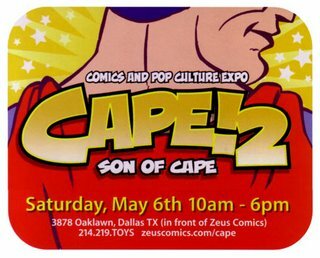 Saturday May 6th, 10:00 am to 6:00 pm, at Zeus Comics in Dallas. This is a totally free, outdoor event, so come on out. Last year was a blast and this year looks to be even bigger. Besides the ultra-exclusive, super-rare chance to meet me (if you don't count last weekend), you can meet Gail Simone, Bryan Hitch, Scott Kurtz, James Kochalka, Josh Howard, James O'Barr, David Hopkins, and many more great comic creators. Oh and I hear rumors of Roller Derby girls skating around as well. Something for everyone! Oh, and not to mention... but it's FREE COMIC BOOK DAY!! Comic shops all over the country, including Zeus of course, will be giving out free comics while supplies last. I'm gonna donate some of my extra Shades issues to Zeus so they can give those out. So come out, bring the kids, get some free comic swag!